Celebrate a New Local Yarn Shop! My good friend Shelley Stone and her partner Marissa Gibler opened a new yarn shop in Moscow, ID--Yarn Underground! Shelley, a great spinner, has been one of my spinning inspiration-ers! A couple of years ago, at a Woolgatherer's meeting, she let me try her wheel. Then she even plied the several yards I made and presented it to me. Most recently--just yesterday--I took my wheel into her shop along with some dyed superwash wool I bought from her a couple of months ago. Decided I needed to try something other than my own alpaca for spinning. As an alpaca farmer, I wanted to start with and learn to spin alpaca. Now that I'm a little bit confident with the alpaca, I wanted to stretch out to something new. It seemed that with the superwash I was getting either too much spin or not enough. Shelley worked with me a little at the shop, helped adjust the tension and assured me that I was not getting too much spin, and I think I've got it! The yarn will be a somewhat laceweight mixture of blues, greens, yellow! I'm planning on making myself a pair of socks. Anyway, back to the yarn shop: Marissa is a great knitter, especially of children's clothing. Shelley has knit some yummy sweaters and she recently got into dying. Yesterday in her shop, she showed me a shelf full of new yarn she spun (from her own dyed fiber). And, some of my alpaca yarn is on consignment at the shop. On display there will also be two of my knitted projects--I took in a new entrelac scarf I made with my own Big Meadow Creek Alpaca yarn and some Cascade Eco alpaca (that I really don't like that much--one-ply, feels more like a lopi--but it is soft). The scarf is "fancied up" with some crocheted corkscrew fringe--I should have taken a picture! I also took in a lace hat made with some of my four-ply alpaca. Now that the Christmas season is coming to a close, I might get back to knitting something for myself. I started an alpaca sweater two years ago that is 80 percent complete! It doesn't look like much in this picture I took--I guess in the summer of 2008! Definitely time to get that project finished! Why Do I Love Entrelac? Why do I love entrelac? I don't know the answer. I just know I do. It seems to go faster. 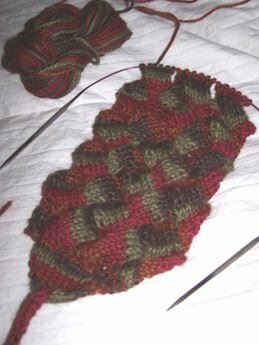 Of course, my other fave is lace, so of course, entrelac goes faster--don't have to think, just knit, backwards knit, pick up, purl 2 together; sl-k-psso--it all just happens. And although Noro is not my favorite yarn--compared to my favorite alpaca--it's scratchy and not soft at all--it works for entrelac. When I'm done with a project, I soak the finished product in water with some hair conditioner added, and that softens the entire thing. My lastest project, a shawl and slouch hat, used Noro Silk Garden Lite in colors that reminds me of a pumpkin patch. What I really need to do is combine entrelac with lace and maybe beads, too! I'll need to find just the right yarn to use, though. Maybe I'll just stick with a nice white or off-white alpaca! I just ordered the new book by Gwen Bortner, Entree to Entrelac--I'm sure that will give me some new ideas. In the meanwhile, last night I picked up a skein of 80% alpaca/20% silk "Paca de Seda" (imported from Peru) in some great autumn colors and started a quick and dirty Quant, which will be soft and silky, yet warm--a great combination (alpaca and silk)! Some fluffy white snowflakes are beginning to fall outside. I guess winter is really here. Temperatures are going to drop to zero and below this week--a great time to sit in front of the fire with needles and yarn! Knitters/spinners/crocheters who spend any time on the internet will be (or at least, should be!) familiar with Ravelry. As they say on the website, "Ravelry is a place for knitters, crocheters, designers, spinners, weavers and dyers to keep track of their yarn, tools, project and pattern information, and look to others for ideas and inspiration." Free and easy to use, the folks on Ravelry definitely inspire me. I find out what others have done with the yarn I have and what yarn others have used to complete projects. I can ask questions, get answers, give and get opinionsabout practically anything under the sun, but especially knitting and yarn. But last night, as I was seeking inspiration, I discovered that some generous creators of knitted patterns have donated their patterns to be used to raise funds for Doctors without Borders (Medecins Sans Frontiers), an "international medical humanitarian organization working in more than 60 countries to assiste people whose survival is threatened by violence, neglect, or catastrophe." For instance, by October 31 (according to their website), they have treated close to 3,600 Haitians with cholera symptoms. Back to those pattern creators: they have donated patterns to a fantastic knitting fundraiser called "pennies per hour of pleasure" or for short, p/hop. On that site, you can download knitting patterns for free. All that is asked is that you freely donate pennies for the time you get pleasure from using those patterns. I was able to wish p/hop a happy second birthday today and write on their blog--you can read it here. My church has an annual "Quilt Sunday" on which the PPQ (the Purple Paisley Quilters) display quilts, serve brownies, and have a service based somehow on quilting. Yes, quilting--but since so many of us PPQ folks are ceaseless knitters as well, the talk I gave a couple of years ago focused on the way both quilters and knitters are workers for social justice. It doesn't take much investigation to find out that knitters use their artistic talents to provide comfort and warmth to premies, cancer survivors, soldiers, the elderly, etc. If you are a knitter, join me--download a pattern (and there are many great ones--I especially love Susan Pandorf's shawls (thank you Susan)--and donate! p/hop is at 73 percent of their goal of $5000--let's make it 173 percent! I Can Spin My Alpaca!! After my brother introduced me to alpaca and alpaca fiber, I would say, "When I retire, I'll buy a spinning wheel and learn to spin alpaca." 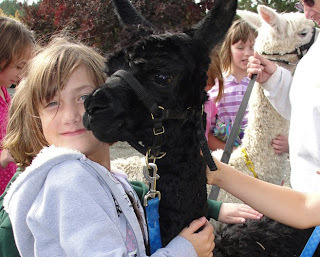 Well, inheriting the alpaca farm sort of forced me to retire (I was of the age, anyway, but loved my job . . . ). And I did buy a spinning wheel--almost a year ago! Although I had friends who said "start with wool--it's easier," I was determined to start with my own suri alpaca fiber. I mentioned this in an earlier post. My beginnings weren't pretty--in fact, I tended not to bring my wheel when my spinning/knitting/weaving friends got together weekly because I felt so pathetic. But I brought it enough and had friends enough who gave me advice and encouragement--I thank them! Fern showed me the magic triangle! Cathy D said, "Someday you will be able to spin, look around, and talk--all at the same time!" And she was right!! I spun my first skein of white suri alpaca from roving that I had (I still have to work from the raw-carded-on-my-own-fleece). Then, because another friend Margo was teaching us some dying, I put the yarn into a vat of indigo dye--once, and then only half of it a second time. Then I got out my knitting needles and ta-da! my own suri alpaca hand knit lace scarf! The fiber came from BMCA Jean Brooke--one of the earliest alpacas born on the farm and named for one of my Girl Scout leaders (BMCA Jean Brooke and BMCA Elinor deserve another entry some day!). I've spun three skeins now--Jean's, Fiorano, and Leroy (see an earlier post). I'm finishing another skein of Leroy into which I'm introducing some greenish/gold dyed mohair (see my earlier post on Leroy). 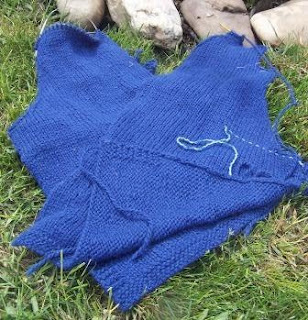 I'm hoping to knit a sweater for my granddaughter from the skeins of Leroy, since she "owns" him--with the best of intentions, it will be a Christmas gift this year! I should be spinning and knitting now!! On two different Saturdays this month, I hosted Girl Scouts--a local troop from Moscow, ID, and one from Spokane, WA. I was ready to greet the girls and leaders with two of my yearling girls haltered--Leyla, my black yearling who loves to get petted and will give kisses, and Madison, a white girl who is almost as friendly. "How cute they are!" was the first thing the girls said on climbing out of the cars. The girls took turns leading Madison and Leyla as we walked to visit the yearling boys' pen. Naturally, the favorite was Miguel (below). They looked at alpaca's feet (which have soft pads and nails, like dogs') and in their mouths (which have teeth in front only on the bottom with a plate on top). Then we walked up to the adult females and provided them with alfalfa treats. 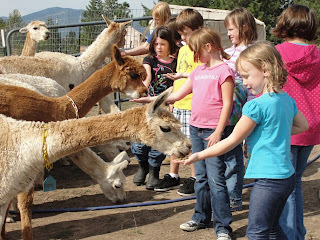 The girls thought their hands were being tickled as the alpacas gently took the treats from outstretched hands with their top lips. The girls were able to learn that alpacas, while not llamas, are in the same family of camelids. Kathryn, the llama, was happy to get some treats, as were the bigger herdsires. They were able to pick out the one huacaya alpaca in the herd (in the picture to the right--the caramel colored girl with white chin and a "do"!) They thought that Leroy, the gelding, had true attitude as he kept his ears back until they held out treats for him! 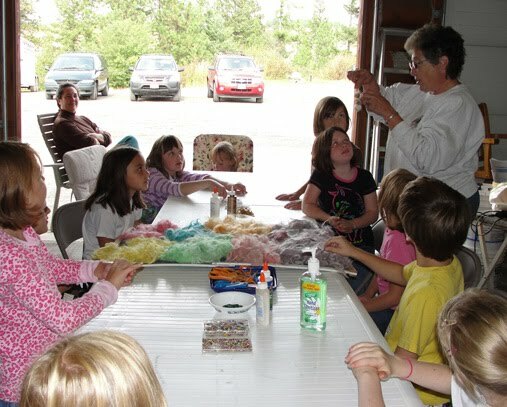 After the girls searched for eggs and admired the young pullets, they gathered around two tables in the garage and made zipper pulls with felted alpaca fiber balls. 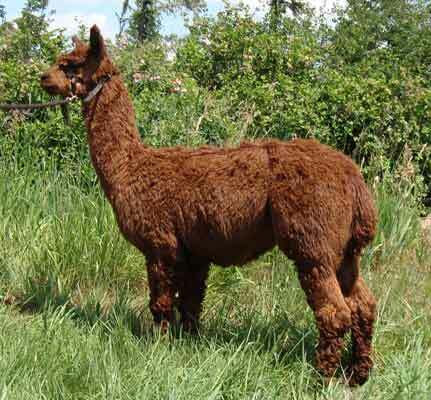 I had dyed the alpaca fiber earlier with Kool-Aid (see the picture below). One of the girls said the purple fiber still smelled like grape! They used needles, beads, embroidery thread, glue, and sequins to decorate their projects. They learned about how fiber is made into yarn and got to see what suri fiber looks like when it has been sheared off the alpaca and is ready to skirt (clean out the veggie matter and short pieces) and to turn the carder. The girls had cake and lemonade and they made me a gift of Girl Scout cookies. How I remember the days when I sold them! They got an alpaca maze, some alpaca puzzles and an information sheet to take home. We made a tour of my garden where they picked and ate fresh green beans, gathered crookneck squash and tomatoes to take home. One of them remembered how I had offered them each a ziplock back of alpaca poop!to take home, since it is such great fertilizer. 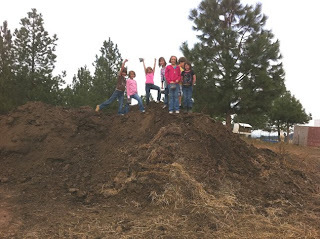 We tramped up to the manure pile and the youngest girls had a great time dancing on top of the manure pile--you never know what might really capture the attention of your visitors!! We all enjoyed ourselves! 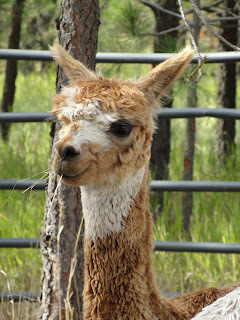 This is Leroy, one of the first alpacas to be born at Big Meadow Creek Alpacas. His dam Yolinda was one of the first imports to this country and was purchased by my brother from Andrea Applegate. His sire was Black Knight. When he was born in August 2002, he was such a big cria that he could nurse from his mother from a sitting position! That's why he was named for a rock--Rock Hudson--whose real name was Leroy Scherer. 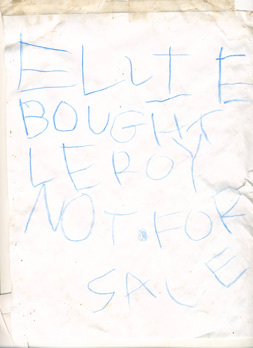 In the fall of 2008, Leroy was on the losing side of a herdsire dispute! Ungelded male alpacas, like other males, sometimes need to prove how macho they are! Leroy had to take a trip to WSU to get stitches in his ear after one of these wrestling matches. To make sure his ear was healed before he went back with the other herdsires, Leroy was put into a temporary pen close to the house. That's where Ellie first saw him. She was visiting me in Idaho for the first time. Four years old, Ellie was fascinated by Leroy. She immediately went for her crayons and paper, sat down near the pen and began drawing. This is one of her first of many pictures of Leroy. One day, one of the crew that works at BMCA put a special bandana on Leroy. When Ellie saw it, she asked her dad what it said. "For Sale," Mike said. "Can I buy him?" Ellie asked. "You'll need to ask Grandma Judy." She came to me and asked and I responded, "Well, Ellie, you would have to pay $1.35 to buy him." She went to her dad, held out her hand and asked, "Please." With the money in her fist, she came to me and I said, "Sold!" Ellie ran into the house and after a few whispered questions into Mike's ear, came out with a piece of paper and taped it to the pen: "Ellie bought Leroy. Not for sale." I understand from my son that after she got home again, she excitedly told her pre-school class about Leroy and his stitches! I haven't billed Ellie for hay, shots for worming and vaccinations, or for shearing, let alone boarding "her" alpaca. 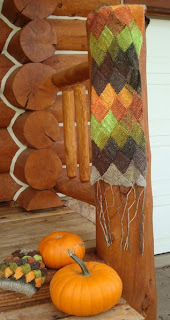 But then again, I've kept the fiber and used it for the second skein of yarn that I spun (see my entry for Oct. 2). It's a wonderful shade and so very soft and lustrous. I'm planning to knit a Christmas gift for Ellie with the yarn I've made. Leroy was gelded last summer and isn't getting into those macho disputes any more. He's a curious, friendly and gentle alpaca. 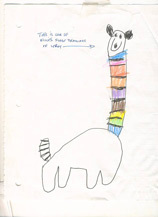 Now if he really had a rainbow neck, I wouldn't have to learn how to dye alpaca fiber! Last Friday when I was down at my studio at the Artisan Barn, I was passing the time by reading an old Spin-Off, specifically an article "A Closer Look at Alpacas" written by Elayne Zorn and Juan Cutipa Colque for the September 1985 issue. Although the first alpacas arrived in the United States in 1984, the first importation began in 1993 and five subsequent imports took place. So, this article was written when alpacas were quite new, especially to spinners. The article includes provides the historical background of the alpacas (that dates to at least the first millenium B.C. ), the current status of herds in southern Peru, and information about alpaca fiber and how the fiber quality is judged. It concludes with "problems and hopes"--problems defined as the contradictory needs of native weaving vs. an international fiber market and poor weather conditions over three years affecting the herds in Peru and Bolivia. I now feel justified in my insistence in calling what is sheared from my alpacas "fiber" rather than wool after reading that "Alpaca and llama hair is classified as fiber"! When asked how long alpacas live, US breeders most often answer, "We aren't sure"--that's because alpacas in the US are cared for differently. Zorn writes that a herd in southern Peru (at that time) "might consist of a mixture of 100 alpacas, 75 llamas, and 200 to 250 sheep." According to Zorn, herders keep their alpacas about eight years before slaughter, "using yields of meat, fat for food, skin for ropes, gut for lashing, etc." Alpacas are rarely used for food in the U.S., but it is interesting to note that Australia actively promotes alpaca meat under the name of LaViande. Herders (at the time) sheared their best alpacas every two years, using the fiber for family weaving. Fiber of "inferior quality" was sold for "factory spinning and distribution" in Peru and to other countries. One thing that frustrates US alpaca owners is talking to someone who has purchased a garment in South America marked 100% alpaca and who finds it to be itchy! We know that "cheap" alpaca sweaters sold to tourists usually has some wool or llama spun in with the alpaca, definitely affecting its quality. In the US, most breeders shear yearly. Yearly shearing is best for the alpaca's health--that fiber is not only warm on us, it's warm on the animals! Some breeders seeking to sell herdsires keep more than a year's growth on their males, but that longer fiber can't be used--mills, or handspinners, don't want fiber longer than five inches. I can now call myself a handspinner! As I promised myself at retirement, I purchased my first wheel--a Louet. 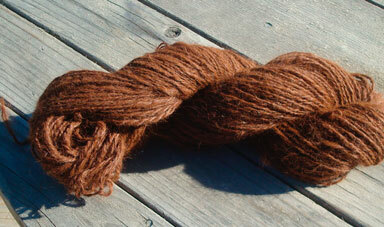 And because I have suri alpacas, I was determined to start spinning with suri fiber rather than wool. The picture above shows my second skein of spun suri roving. 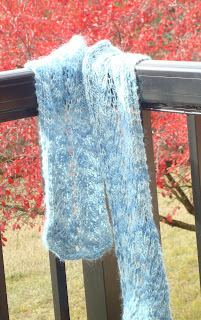 My first skein, white, was dyed in indigo and subsequently knit by me into a scarf, which I will treasure always! The fiber for this skein came from "Leroy." 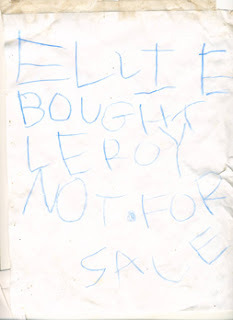 I'll save the story of "Leroy" for some future post. Yes, it's an alpaca farm! But alpacas aren't the only creatures (read "living" creatures) around! This morning, in fact, I was working on the computer, looking out the window, and I saw a rather unwelcome sight! 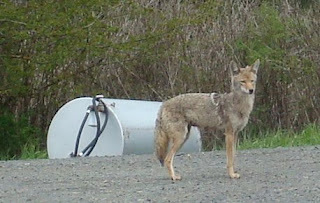 Yes, right out in the driveway--a coyote, looking like he belongs here. I'm glad that all my crias are not so small any more . . . and that there were no chicken feathers hanging out of the coyote's mouth! Maybe he was just a sign of the wierd spring we are having. And it has been wierd--high winds, show, sleet, hail, rain, wind, and more rain. Planning for this year's shearing, I thought we weren't going to have trouble with mud on the feet/legs, but over the past two weeks, all that was dry lot is now "mud lot." But the grass is growing taller [too wet to mow :( ], the trees are in bud, the daffodils and narcissus are in full bloom and the tulips getting ready! But plans for the garden are also on postponement! Hopefully, the potatoes and onions put in two weeks ago aren't rotting underground. I had a new greenhouse erected over the winter and we haven't quite learned how to use it yet. Although I have had lettuce, spinach and radishes to enjoy for over a month. was wet and windy--I was in the garage skirting fleeces and looked out at my Dodge Ram that was parked in front of the garage. This male bluebird was flirting with himself around the side mirror. He hopped all around it, hanging on the door, sitting on the mirror. I learned from a good birder friend of mine that bluebirds (and robins, he said!) have this habit--they are acting aggressively toward another bird in their territory! At one point during the afternoon (because this went on and off quite a few hours), I saw the female sitting on the Dodge roof--"What a silly male," she seemed to be saying! On another day when I was down at the pen of weaned crias, down at the edge of the woods, I saw another pair (or the same pair?) I had recently purchased some beautiful handcrafted bluebird houses from a friend of mine, and I got them up as soon as possible. I haven't seen any action around the birdhouses yet, but it's been so miserable, when I go out to feed the alpacas, I get it done as soon as possible and get back inside! The hummingbirds are back, too! Saw some flitting around the back porch and so put out the feeders, but the feeders are emptying in the high winds. The kingfisher is back, checking out the spawning goldfish in the pond. The dreaded flickers have been back and we've already had to seal up some holes they made. I've had someone knocking on my front door and ignored it, thinking it was the flickers back at the grouting between the logs! They are attractive, but cause too much damage for me to enjoy them. Looking out the window--it's snowing again! But the Ren Fair is over and Mother's Day is coming--maybe we'll get some sunshine again!